An unanticipated negative result of the presidential election is that interest rates jumped .25%-.375% higher in just two days following the election. This is only the second time that significant a rise has occurred that fast. The immediate effect of this on housing sales is that buyers borrowing capacity just dropped. For example, let’s say someone qualified last week for a $1,000,000 loan at 3.75%. This week, with the higher interest rate, they only qualify for a $956,000 loan. Buyers can afford less so offers go down, and then sales prices go down. The median single family sales price of $1,350,000 is 13.6% higher than last October, off slightly from May’s peak of $1,400,000. 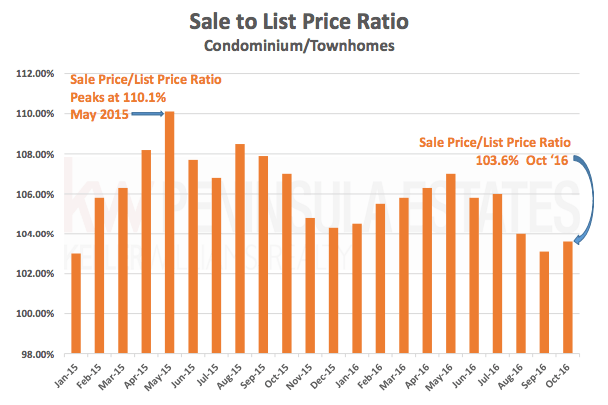 However, the sales price for condominium/townhomes is down almost $100,000 to $719,000 from its peak of $818,000 in April. 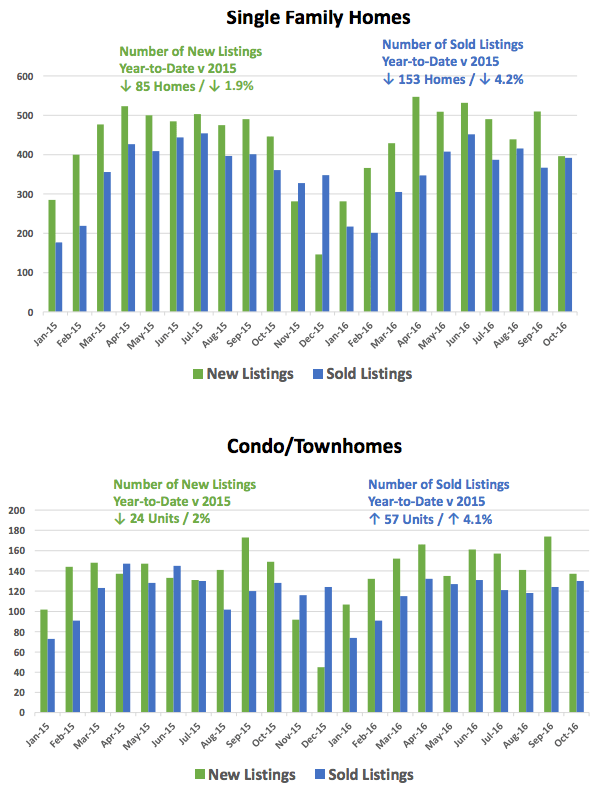 Inventory remains very low, with just 1.7 months inventory for homes and 1.2 for condominium/townhomes. This means that if no new listings came on the market starting now but sales remained at the same current pace, it would take 1.7 months for all of the homes to be sold and 1.2 months for all of the condominium/townhomes to be sold. 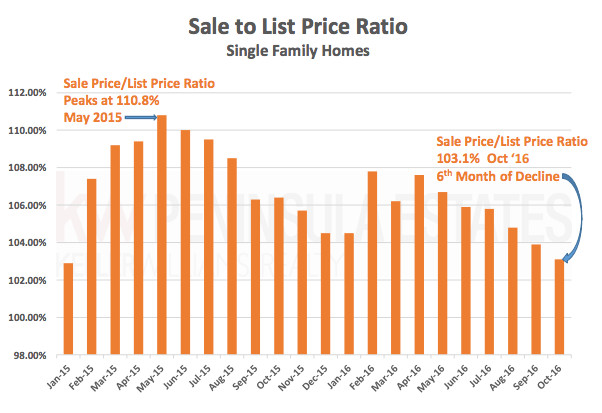 We also see that the sale-to-list-price ratio continues to decline for single family homes in spite of a strong month of sales. Nevertheless, it is still above 100%, the territory it’s been in since April 2012. 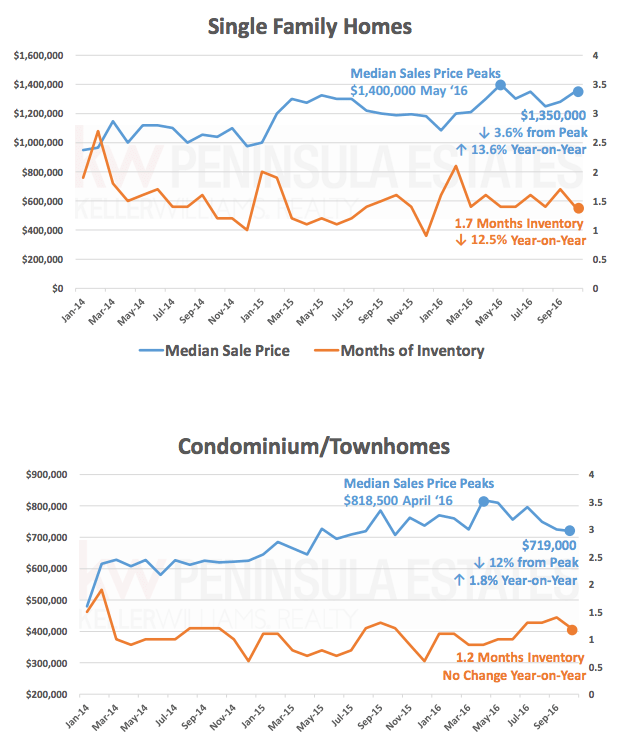 With 2016’s selling season wound down at the holiday season, and incredibly low inventory for both homes and condominium/townhomes, we anticipate that demand will continue to outpace supply when the 2017 Spring selling season starts.